TCBY, which has its roots in Utah, is officially back in town! I remember making frozen-yogurt runs (these days they&apos;re probably called "froyo" runs) to the University Mall TCBY back in my college days. Now I have a TCBY in my own backyard—it&apos;s like the Freshman 15 all over again, but only tastier with more options! The new TCBY Sugarhouse location is the first corporate store for TCBY in five years. The latest location features a self-serve option and fresh new layout and design. It also has 10 flavors of soft-serve frozen yogurt, 98% fat- free and sugar-free options, as well as sorbet and more than 30 topping options. 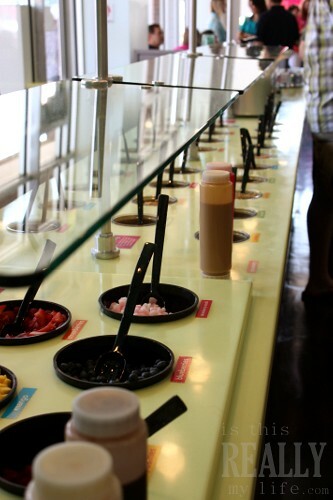 TCBY’s signature soft-serve yogurt and fresh fruit toppings are perfect for a healthier, more well balanced lifestyle. TCBY&apos;s product line also includes no-sugar-added yogurt, yogurt cakes and pies, plus dairy-free nonfat sorbet flavors. Don&apos;t worry...if you are in the mood for a rich chocolate dessert topped with peanut butter cups, hot chocolate sauce and marshmallow sauce, they have those decadent options as well. Because let&apos;s be honest, sometimes you want what you want...and you want it covered in hot fudge. The gals from SassyScoops.com visited the new TCBY in Sugarhouse for their VIP media event. Feel free to read what we really thought about the yogurt, the toppings and the "yogurt off" involving famous local Utah chefs! You can read more about Emily and her love of food, especially the kind in the "dessert" food group, at isthisREALLYmylife.com.